Virginia Heritage at Lee's Parke is an active adult community located in Fredericksburg, Virginia. Lee's Parke is a master-planned community with a gated entry, with Virginia Heritage claiming 416 adjacent acres for its own separate 55+ community. 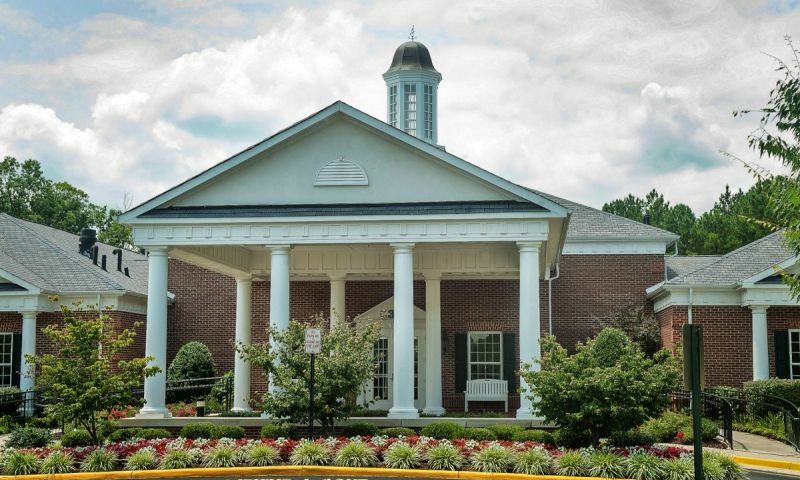 Virginia Heritage offers its own clubhouse, which serves as the community focus for its residents. Set among the gently rolling Virginia countryside, Virginia Heritage at Lee's Parke offers historic, small town charm combined with all the metropolitan conveniences that the Fredericksburg area has to offer. The close proximity of the Rappahannock River and nearby Lake Anna creates an abundance of boating, fishing, and beach activities. Virginia Heritage at Lee's Parke is also close to the Fredericksburg Country Club Golf Course. The recently renovated 16,000 square-foot clubhouse offers a variety of great amenities. Residents can make full use of the modern fitness center with aerobics studio and indoor pool to stay in shape. A fully appointed library and a billiards area allow for some rest and relaxation. Internet-ready computers allow residents to stay connected and take care of business as needed. Hobbyists will enjoy the card room, arts and crafts areas, and the woodworking shop. The Heritage clubhouse also features a ballroom, which is the perfect space for organized and social events. Outdoors, residents can practice on one of the tennis or bocce ball courts, take a refreshing dip in the outdoor swimming pool, or enjoy a leisurely stroll on the walking and biking trails. Construction of Virginia Heritage at Lee's Parke began in 2005. All homes within are the community are low-maintenance and come in a variety of sizes with first-floor master suites. Lennar Homes offers three model collections from which to choose. The Cottages contain two models that offer between 1,366 and 1,936 square feet of living space with two to three bedrooms, two to three bathrooms, and an attached two-car garage. The Manors collection features four models between 1,831 and 2,379 square feet with two to three bedrooms, two to four bathrooms, and an attached two-car garage. The Plantations collection offers the largest homes in the community with 2,215 to 2,816 square feet with at least three bedrooms, two-and-and-a-half bathrooms, and an attached two or three-car garage. There are also homes that were originally built by D.R. Horton available in the community on a resale-only basis. They are single-family homes that are between 2,057 and 2,505 square feet in size with at least three bedrooms, two to four bathrooms, and an attached two-car garage. Active adults at Virginia Heritage at Lee's Parke enjoy living in a modern, social community with great scenic backdrops that are developed by respectable homebuilders. Residents at Virginia Heritage get the best of both worlds - old and new. This 55 and over community is in close proximity to the greatest collection of beautifully restored 18th century homes in Old Town Fredericksburg. On-site, residents get to enjoy a variety of activities, amenities and recreation at the fabulous Heritage Club. A full-time activities director assists in keeping the social calendar filled. There are also a variety of established clubs residents can join, or they can start their own. Some of the existing clubs are pinochle, art club, writers club, Mexican dominoes, history club, quilting bee, karaoke, potluck, lunch group, and book club. Just minutes from Virginia Heritage at Lee's Parke is historic Old Town Fredericksburg. While walking the tree-lined streets, residents can discover great restaurants, entertainment, exciting boutiques and shops, as well as nationally known retailers. Fredericksburg, Virginia also offers excellent healthcare - especially at the state-of-the-art Mary Washington Hospital. It also offers great education, for example at the prestigious Mary Washington University, which also offers cultural events. The vibrant metropolis of Washington D.C. is only a 45-minute drive from Virginia Heritage. A 45-minute drive to the south will take residents to Richmond. Both cities have international airports, as well as lots of cultural attractions and historic sites. The majestic Blue Ridge Mountains beckon two hours west of Fredericksburg and make for a great scenic destination during all four seasons of the year. Heritage Club - 16,000 Sq. Ft. There are plenty of activities available in Virginia Heritage at Lee's Parke. Here is a sample of some of the clubs, activities and classes offered here. Lennar offers two floor plans in the Cottages collection. These single-family homes offer two to three bedrooms, two to three bathrooms, and an attached two-car garage. Ranging from 1,366 to 1,936 square feet in size, the Cottage homes are the smallest within the community. Lennar's Manors collection offers four single-family home models that range from 1,831 to 2,379 square feet. There are a variety of options with two to three bedrooms, two to four bathrooms, and an attached two-car garage. Optional basements offer more room for entertainment or storage. Lennar's Plantations models are the largest homes within the community. Ranging from 2,215 to 2,816 square feet in size, most of these single-family homes have at least three bedrooms, two-and-a-half bathrooms, and an attached two or three-car garage. Most homes include optional basements that offer more space for guests with flex rooms and additional bathrooms. D.R. Horton's single-family homes have 2,057 to 2,505 square feet of living space with at least three bedrooms, two to four bathrooms, and an attached two-car garage. Included basements offer options for dens, flex rooms, storage space, or an additional bathroom. These homes are available on a resale-only basis. We have lived here for 3 years and find the community to be a great place to live. Good management in place, friendly people and a sense of pride for the community. The Clubhouse at some times is too small but that issue is being reviewed and accessed. It's interesting to hear the previous poster feels the clubhouse is too small. We were out looking at homes here over the weekend and I never would have thought about that. It seemed huge at the time but I guess once you have all the homes built and more people living there, maybe it won't work as well? I would have to assume the builder knows how large of a facility to build to accommodate the size of the community. Even so the clubhouse is very nice. We liked that it is a gated neighborhood and the location is perfect for us. The homes seem nice and the people we met there were very friendly. Looks like we have a big decision ahead of us! Very friendly community. EXCELLENT SOCIAL DIRECTOR AND MANAGER. Presently, there are approximately 400 families in the subdivision. At some events the clubhouse is not large enough to accommodate all who wish to attend some events. When all of the approximately 800 units are completed, the clubhouse will definitely not be able to accommodate the community. The primary builder who is in charge is not interested in increasing the size of the clubhouse. They are more interested in beautifying the present clubhouse in order to sell homes faster. 55places.com is not affiliated with the developer(s) or homeowners association of Virginia Heritage at Lee's Parke. The information you submit is distributed to a 55places.com Partner Agent, who is a licensed real estate agent. The information regarding Virginia Heritage at Lee's Parke has not been verified or approved by the developer or homeowners association. Please verify all information prior to purchasing. 55places.com is not responsible for any errors regarding the information displayed on this website.